Mozuku Seaweed and Cucumber Sunomono (Vinegar Salad). Sunomono is one of the most basic Japanese salads available in Japanese cuisine. In broad terms, sunomono refers to any salad that is simply seasoned with rice vinegar in combination with ingredients such as sugar, sake or mirin and salt. Typically, vegetables such as cucumbers, carrots, daikon and kelp (known as "wakame" in Japanese) and tossed and marinated in a rice vinegar dressing. Use one 70 gram package of mozuku to make one medium serving of the sunomono, or split this in half to create two small appetizer or side dish portions. Slice Japanese or Persian cucumber into thin pieces. Either grate fresh ginger (after peeling off the exterior skin), or pre-grated ginger that is available in tubes in the Japanese market. 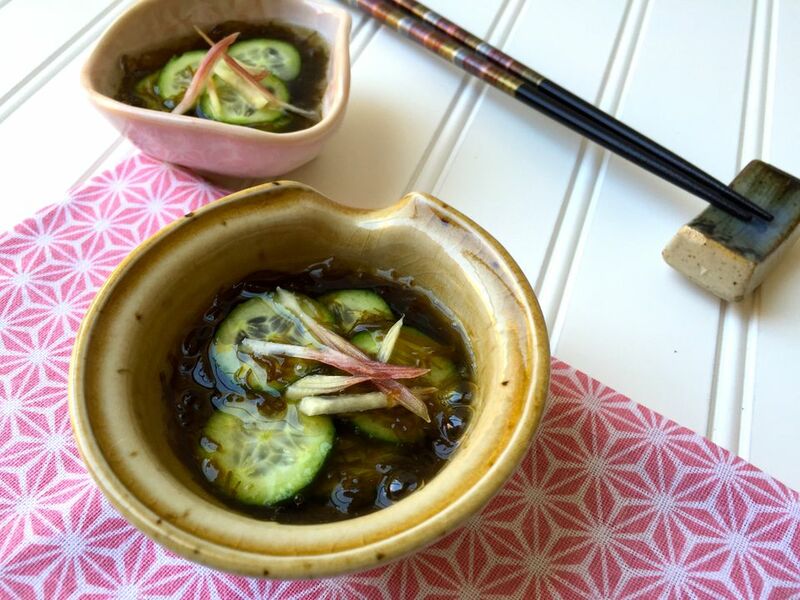 In a small and shallow appetizer bowl, add sliced cucumbers, then pour mozuku seaweed over the cucumbers. Finally, garnish with grated ginger. Alternatively, thinly slice myoga ginger root and use as a garnish. Myoga adds a fresh and lighter flavor to the mozuku sunomono, without the hint of spice from freshly grated ginger. Best when served immediately while still cold. Otherwise, store in the refrigerator to chill until ready to serve. This mozuku seaweed salad slightly differs from the traditional sunomono salad primarily because the vinegar dressing is included with the mozuku seaweed. Mozuku is a popular type of Japanese seaweed that is originally from the Okinawa prefecture of Japan. In the past, mozuku was readily available only in the ocean waters of Okinawa, but recently it is more common to find cultivated or farmed mozuku seaweed available for sale in grocery stores. Mozuku seaweed is classified under the species Cladosiphon okamuranus, and it is dark brown or almost black in color and is a very thin and soft seaweed. The texture is smooth and slimy, similar to other seaweed or kelp. Mozuku is sold frozen in its natural state without any seasonings, but more popular at Japanese grocery stores are the small individual serving packages (similar to that of natto or fermented soybean packages) of mozuku served in a generous amount of vinegar dressing or liquid. These are available in the refrigerated section of the market. The vinegar dressing that mozuku packages are sold with is used as the dressing for this simple mozuku and cucumber sunomono recipe. The dressing is so flavorful that nothing else is required other than the dressing from the mozuku. It makes this recipe only that much easier to prepare. It's "instant sunomono"! Add refreshing aroma and taste to your mozuku and sunomono salad by garnishing it with just a touch of freshly grated ginger, or a few thin slices of myoga ginger.